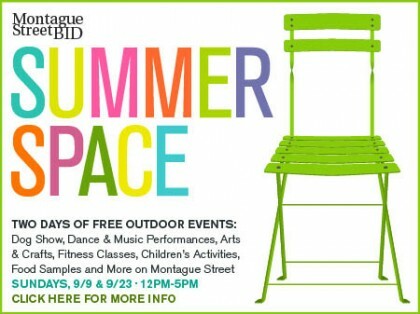 Coming up Sunday, September 9th and September 23rd, the Montague Street BID presents its annual Summer Space, with a bevy of fun, free events. Closed to traffic and re-imagined as a pedestrian oasis from noon to 5 p.m. both Sundays, Montague Street restaurants will expand outdoor seating and hand out free samples, while other retailers will offer special promotions and services. Hundreds of tables and chairs will also line the street. In addition, there will be free outdoor yoga and Zumba classes, as well as chess tables, courtesy of the Brooklyn Daily Eagle; Etsy New York Team presenting craft-making demonstrations; and for the kids, a photo booth, scavenger hunt, hula-hoops and chalk drawing. For a full schedule of events & more details, click here.